Today, we are discussing a colorful root vegetable: the radish. I recall the “radis croque-sel” (literally means “radish bite salt”) served at my elementary school many years ago. A few pretty radishes with butter, a bit of salt and French bread were served on the school lunch tables as a starter (entrée). Except for the baguette and butter that came with the radishes, I was not a big fan! Since then I had my share of “radis” and I eat them with pleasure. Radishes are a year round vegetable but I much enjoy picking up a few “bottes” (bunches) at the farmer’s market during Spring when they are at their best — they get a bit too spicy in the summer but that’s a question of preference. Check below for our top 4 reasons to add radishes to your diet and shopping list to get all of the goodness that radishes can offer. Enjoy and bon appétit! Radishes are so simple to prepare: radishes make very easy to prepare healthy appetizers or starters before a main course. Wash, dry, cut both ends, and voilà! For a snack, you can eat them as is. For a starter before a meal however, I like to serve them with butter, a bit of salt to taste and some fresh baguette (radis à la croque au sel). You can save the leaves (fanes) to add to a lettuce or a soup — great source of vitamins and iron. Radishes are easy to grow at home: it is so much pleasure to see little gardeners plant radishes on their own. And then they get to make and eat their “radis-pain-beurre” (sort of like a radish-butter sandwitch) — adorable! Growing up, we use to have our little radish corner (coin radis) in the garden – sweet memories. Radishes are healthy: radishes have a good amount of fibers (great to promote digestion) and are rich in Vitamin C as well. 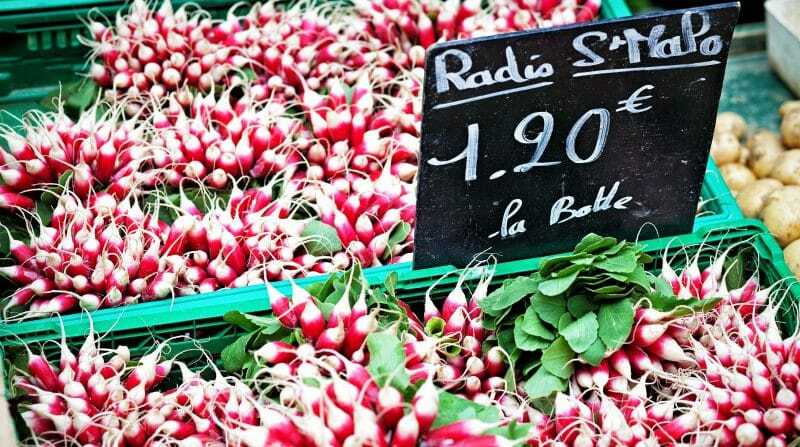 So if they’re not too spicy for you in the winter — go for a dose of Vitamin C with radishes. Radishes can help you lose weight: radishes are a low calorie (10 calories for 1/2 cup! ), nutritious and delicious alternative to other high calorie snacks. With their radiant red color, their spiciness, and their crispiness, radishes are one of Art of the Home’s top on-the-go snack. Especially during Spring, the time of the year where most of us can afford to lose a few pounds. Radishes can also be sliced and add to any summer salad for added flavor and crunch. Enjoy!